THIS IS AN ALPHA 'PREVIEW' RELEASE.
! BUGS AND MISSING FEATURES ! Syntax for macros may occasionally change during alpha phase, but once the addon reaches beta the KMacro addon syntax will be stable and should see minimal changes in future. Please note: Users upgrading from versions prior to 0.3.4 may need to update any of their KMacros that used macro shorthands (such as [Tx] for talent-casting). The wrapper symbols for these shorthands have been changed from "[x]" to "<x>"
This addon has been in development on-and-off for a number of months and I've been using it myself since 5.0. I'm releasing this alpha version to get feedback from users on usability and functionality and to get the ideas and code out. 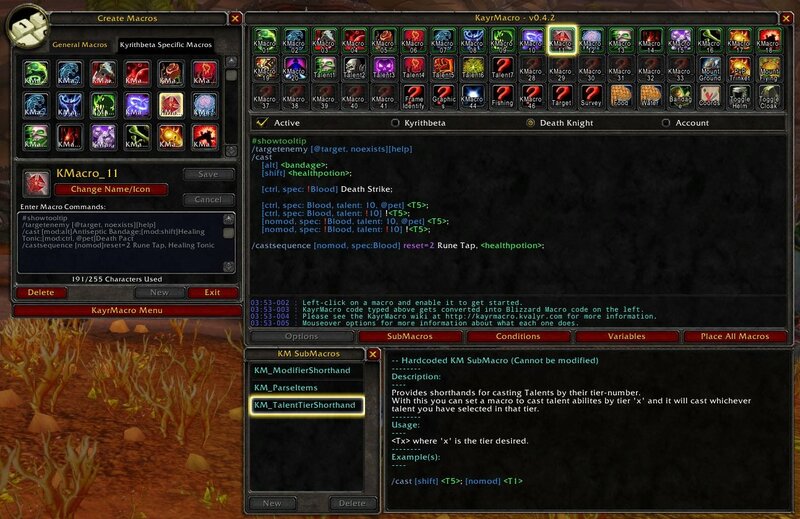 KayrMacro (KM) is an AddOn for World of Warcraft that expands the functionality of the game's built-in macro system. It adds new conditions and keywords; and greatly expands macro storage, all while retaining full compatibility with the default UI as well as all ActionBar addons. KM never modifies existing macros and does not interfere with the normal usage of macros in WoW. KM will only modify/rewrite macros that have been 'enabled' in the main KM window. Players can choose to give KayrMacro control of none or all 54 macro slots in the default macro UI. account-wide, class-wide or character-specific basis. changed at any time (out of combat) by the user. re-writes the macro's code when necessary. KM adds a number of new conditions to macros for choosing actions according to class, spec, talent-choices, known spells, etc. Note: The new conditions added to the macro system by KM are ONLY PARSED OUTSIDE OF COMBAT. The WoW API prevents macros from being edited during combat and KM makes no attempt to circumvent this limitation. KM cannot automate macros during combat, it is simply a way to consolidate macros according to new out-of-combat conditions. is longer than 1023 characters. The addon warns the user in the rare case that this is an issue. Talent-spells can be cast by using <Tx> in place of a spell name, where 'x' is the tier of the talent. + Macros written in KM can have as much or as little whitespace as the user desires. + KM ignores whitespace and even linebreaks in most circumstances. + The semicolon ( ; ) is used to signal the end of a 'line' in a macro. slash command for readability in a macro. states such as the player's chosen spec, talents, available items, etc. macros indistinguishable from hand-written macros in the default UI. + KayrMacro requires empty/available macro slots to work initially. + Please report any incompatibilities discovered to Kvalyr on the WoWInterface.com page for this addon. Place the "KayrMacro" folder inside "[WoW Folder]\Interface\Addons". Enable KayrMacro in the Addons menu on the character selection screen. considered a breach of copyright. in any state must NOT be considered as permission, implicit or otherwise. these accompanying notices must remain intact and included with the software. - Infinite-length macros disabled by default until the feature has been properly fleshed-out. - Major optimization pass. Core addon functions should run without any tangible impact on game performance now due to added caching of intermediate macroBody states. - Added new constants (in the 'variables' menu) for frequently used pieces of macros. - Added 'words' for different forms/stances. Example: "form:<bear>" can now be used instead of "form:1"
- Added menus to view SubMacros, Conditions and Variables and their documentation! These menus currently just display information and usage instructions for KM's built-in macro components. - Added substution submacros for using items like <gloves>, <belt>, <cloak> (eg: for engineering tinkers), <trinket1>, <trinket2>, etc. - Important: Changed wrapping symbols for all submacro functions from [x] to <x>. This includes talent and item shorthands. This was necessary in order to support features in developent for future release. Example: [T1] (for casting 1st-tier talent) should now be written as <T1> in macros. Macros will need to be updated manually. - New feature: Infinite-length macros (in theory). See Wiki for info. - Macros containing /script or /run slash-commands will no longer be parsed for KM conditions etc. This addon seems to constantly forget which macros are activated on my druid. Also, is it possible to add some functionality to use some of the macro-options for whole chunks of code that would get switched out of combat? Addtionally, I often find myself missing something like this: "[known:Spell,]Spell" which would translate to "Spell" instead of the ususal "[known:Spell]Spell" -> "Spell". There should be no reason to ever use "/cast" in a condensed macro, should there? After all "/use" is the very same thing and is shorter, since some (read all) spellnames translated from English into other languages always end up being ridiculously long and intricate every single letter counts. Last edited by Noradin : 10-30-15 at 10:23 AM. Please add an icon search function, I like to assign icons to my moves to make it more unique to me. This addon lacks that, look to Macro Toolkit for an example of this. 0.4.6 has been uploaded and will be available soon (pending WoWInterface moderation). It's just a maintenance update to keep the addon vaguely up to date, but it also brings some substantial performance improvements and some minor bugfixes. Infinite-length macros have been disabled by default until the feature has been properly fleshed-out. Last edited by Kvalyr : 06-15-15 at 07:52 PM. I have an issue. When I get in combat, the kmacro I've selected to active, and placed on my bars vanishes from my macros slot and off my bars. Then when I get out of combat, it reappears in my macros pane. That sounds strange - Are you certain that your bars aren't paging (if you're using an actionbar addon such as Bartender) ? If you can post the contents of the macro itself and the settings chosen for it as well, that would make it easier for me to diagnose the issue. I hope to get back to working on this addon next week, RL is quite busy right now. Last edited by Kvalyr : 11-20-14 at 02:56 AM. Really looking forward to the progression of this Addon. Amazing job! Re: option to turn off dynamic icons? can I do this somehow? Your #showtoolip and #show are probably conflicting in a situation like this. Are you seeing unexpected behaviour from KM, compared to normal macros in this case? Thanks for the support! It means a lot. option to turn off dynamic icons? working in the near future? Probably not in the near future - The infinitely-long macros feature is experimental and I don't have as much time to work on the addon these days; and there are other things that need work more urgently. It's on the to-do list, but I'd be lying if I said it'll get done soon. When it's done, you'll see it mentioned in the change log. Just a quick update to account for some changes in 6.0.2 that I didn't catch during the beta (due to RL taking me away from addon development). More importantly, 0.4.4 brings a major optimization pass to the core functions of the addon. Prior to this version the addon's impact on performance wasn't noticable on faster CPUs, but occasional stutters were apparent on machines with slower CPUs when entering/exiting combat with all 54 KMacros enabled. This was due to the huge amount of string processing the addon needs to do on-demand. In 0.4.4 I introduced some serious caching to the macro-parsing part of the addon and optimized some of the loops, which should get rid of any of the previous stuttering. Future versions will take these optimizations further and put the processing into something vaguely similar to a secondary 'thread' (via lua coroutines). This is something I've used extensively elsewhere in my KLib library (the code that underlies KM) and should go a long way towards eliminating any noticable performance impact of the addon even on old/weak PCs. Development on KM has slowed considerably but I hope to get back to it soon™. maybe you could mention in the wiki that class-condition works with english names (druid, mage,...) but spec-condition needs the localized names. edit: this is not always, testing more. KM has no support for languages other than enUS and enGB yet, sorry - It's on the roadmap but I want to tackle localization properly once I get to that point. As a more general update - I've started a new job and moved country so things are a bit hectic for me right now. Development on KM has slowed considerably but I hope to get back to it soon™.